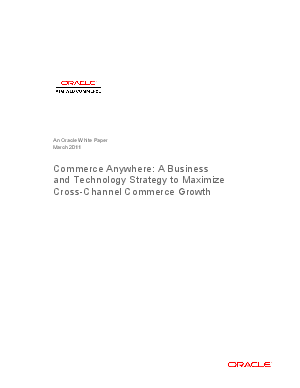 Commerce anywhere describes the approach Oracle believes businesses must adopt to serve today's anytime-anywhere consumers in a seamless, personal way-be it on the Web, in a store, over the phone, via mobile device, or all of the above. This white paper details a commerce-anywhere approach that encourages businesses to extend their concept of the research and purchase process beyond individual transactions. Businesses will need to adopt a holis! tic view of the customer lifecycle, using both traditional information and new sources such as social media.